Happy Valentine’s Day from Istanbul! This week, I have been swamped with baking hundreds of heart-shaped cookies. I hosted three successful baking classes with new and old friends at my home. And today I’m simply resting. Since today is all about love, I thought I’d dedicate a post to one of my favorite Turkish delights that I’ve fallen in love with – kaymak. If you don’t know what kaymak is, you are simply missing out on a piece of heaven! Kaymak is the Turkish version of clotted cream. It’s thick, rich, creamy and utterly divine slathered on Turkish white bread for breakfast! Kaymak pairs perfectly with Turkish honey and honeycomb. Fresh manda kaymak served with Turkish honeycomb at home. Kaymak is made from milk – preferably from water buffaloes, known as manda in Turkish – that is slowly boiled until a thick layer of rich cream forms at the top. After it cools, the cream is skimmed off, rolled into little logs and left to chill. The logs of kaymak turn solid when refrigerated but turn creamy and nearly liquid when at room temperature. On the weekends, we generally treat ourselves to a traditional Turkish breakfast out in Istanbul. If we are at a new restaurant, I immediately look to see if balkaymak (kaymak served with honey) is on the menu. I love kaymak for breakfast! 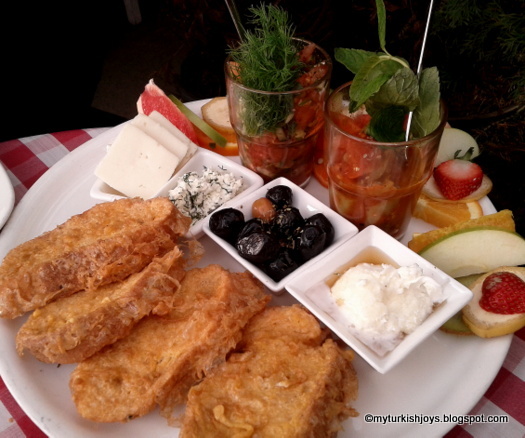 One of the Turkish breakfast plates with a dish of balkaymak at Cafe Nar in Istanbul. My husband is sweet enough to even save the last bite of balkaymak for me because he knows how much I love it. Kaymak also plays an important role in the Turkish breakfast sweet called katmer which originates in Gaziantep. (Remember this post: Gaziantep: Indulging in Sweet Katmer). Luckily, in Istanbul, you can find a version of katmer at Çiya in Kadıköy. It's like a little envelope filled with love at Çiya. Besides breakfast, you’ll find Turkish kaymak in baklava and lokum from Safranbolu as well as a garnish for many Turkish desserts such as künefe (shredded phyllo dough baked with cheese and a sugar syrup) ayva tatlısı (roasted quince) and tel kadayıf (shredded phyllo dough baked with nuts and a sugar syrup). A version of tel kadayıf served at a friend's home recently. Künefe is one of my favorite Turkish desserts! The combination of hot, gooey cheese baked between sweetened layers of shredded phyllo dough is just sublime! A perfect version of künefe served at Urfali Haci Usta in Istanbul. So if you’re visiting Istanbul or Turkey, you simply must make a point to try kaymak as often as you can. Just be sure to walk off the extra calories later. I doubt anyone can love kaymak more than I do! I love kaymak too! Especially balkaymak. So nice to hear that I can find katmer with kaymak at Ciya. I hear that Serger (nearby) has excellent katmer also. now i have something new to look for. i would love this stuff! @Manya, I was sure I wasn't the only one. ;-) Hmmm...I don't know Serger, but I will have to check it out next time I'm in Kadikoy. @Joyce, oh yes, I'm sure you would love kaymak. It's simply divine! We love kaymak with strawberry jam on English scones. A bit of East meets West. @BacktoBodrum, oh, now that sounds like a divine way to eat kaymak too! I'd just have to make the scones. Have you tried Kaymak at Besiktas Kaymakci ? My husband loves kaymak. To be honest I've never really tried it, but will next time I get a chance too. Love the breakfast picture sure looks better then going to Dunkin Donuts. @Anonymous, Yes, but it's been awhile. The shop is definitely due for a visit. @Erica (Irene), oh, if you love rich, creamy, sweet things, I promise you will love kaymak as well! Ah - what a wonderful ode not only to my beloved kaymak - but to katmer as well! I discovered the latter in Urfa and have never looked back. Working on making ayva tatlisi right now, which, of course, can't live with out kaymak! 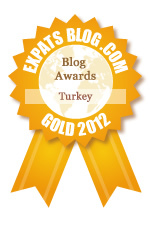 @Liz, hopefully, you'll be eating plenty of both once you're here in Istanbul! @Amy, I'm not sure if kaymak would be available. Maybe in a Med/Greek/Mid Eastern store? Otherwise it's like a thick clotted cream. Sooo good! 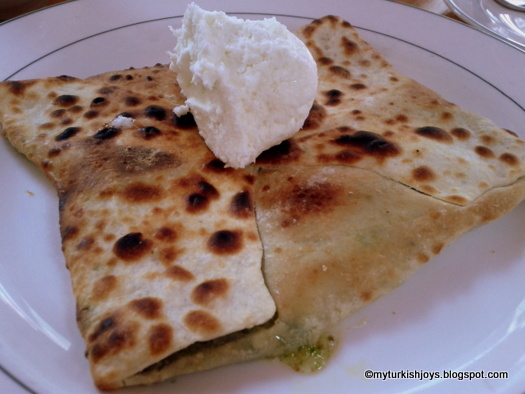 I will be visiting Istanbul in April 2014, where should I try Kaymak other than at Pando Kaymakci?? Thank You.